This is a sponsored article on behalf of Vapiano. Nothing beats a beautiful bowl of fresh pasta. But where's a time-poor Londoner to go for a taste of la dolce vita? 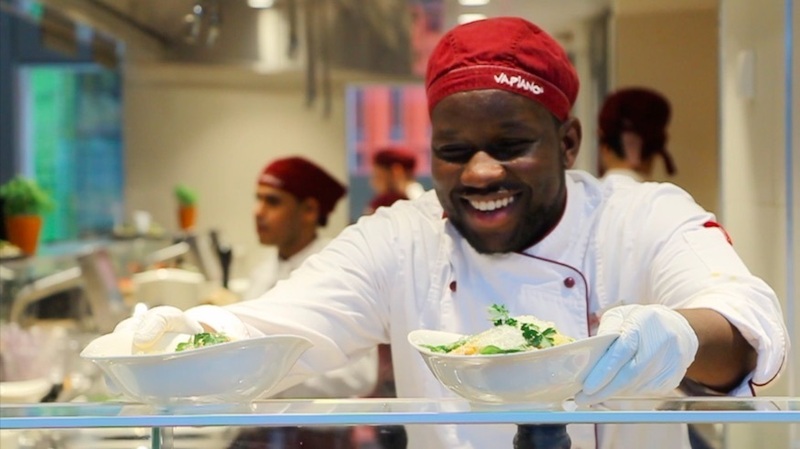 Vapiano, which boasts five restaurants across the capital, have got it covered. Every day, the chefs make nine different varieties of pasta from scratch, plus all your favourite sauces. Choose your dish and watch them bring it to life in a matter of minutes — with the option to tweak it to your tastes. So if you want your gamberetti e spinaci to pack an extra big punch, make sure you as for extra prawns and chilli. We went to have a nose around Vapiano's brand new Centre Point restaurant to see how it's done. If you're not already feeling hungry, you will be after watching this. The new Vapiano is in Centre Point at the end of Tottenham Court Road. The address is 12 Giles Square, WC2H 8TA.